Mist Ecology Case Study - Paragon Innovations, Inc.
Mist Ecology Selects Paragon Innovations to Design Electronic Controller for Evaporative Coolant Product. Mist Ecology, founded in 2007, provides innovative products that increase the efficiency of residential and commercial air conditioning units. Air conditioners cool by absorbing heat inside buildings and moving or releasing it to the outdoors. As it gets hotter outdoors and more cooling is needed, the amount of heat that can be released is reduced. Yet the compressor has to work harder to raise the refrigerant to higher pressures. This results in the AC unit using more electricity and having a lower cooling capacity. AC Spritzer’s unique design incorporates a control valve that insures that water is misted and evaporated only when outdoor conditions are hot enough to make a substantial benefit. The pre-coolers also have replaceable filters to capture any mist not evaporated and prevent mineral deposits from accumulating on the condenser coils. The initial version of AC Spritzer used an off-the shelf controller and required third-party, EPA-licensed installers to tap into the Freon line to connect the controller. As a result, Mist Ecology incurred repair costs when the product was installed incorrectly. In addition, the misters turned on every time the AC unit turned on, whether or not the misters were needed. Paragon Innovations held multiple brainstorming sessions with Mist Ecology to determine the conditions when the misting system is most useful based on temperatures outside and inside the house. During these sessions, it also was determined to allow the customer to have more control of when the misters turn on and off. Paragon also sourced parts and manufacturing to manage and deliver the initial order. 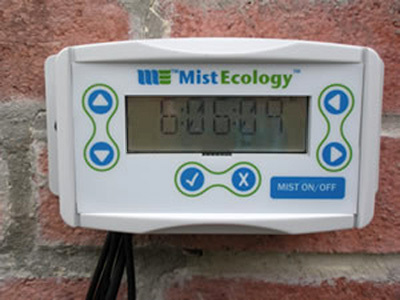 Through a collaborative process, Paragon designed and delivered a feature-rich controller that was easy to install and program, and which opened up a new “do-it-yourself” market for Mist Ecology.